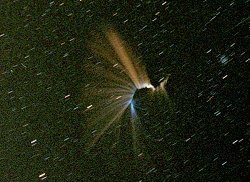 The 1998 Leonids: a bust or a blast? November 27, 1998: In Hong Kong the night of November 17, 1998 was exceptional. A cold front had just passed through, skies were clear, and seeing was superb. One member of the Hong Kong Astronomical Society called it "the best night in Hong Kong this decade." It couldn't have happened at a better time, as sky-watchers there and in other parts of the world were treated to a spellbinding display of Leonid meteors. Right: This stunning -20 magnitude fireball exploded around 2025 UT on November 16th over Hong Kong. It was captured on film by Charanis Chiu of the Hong Kong Astronomical Society. 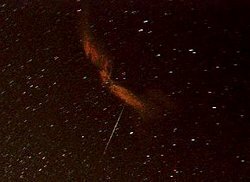 More photos of this fireball are located at the Leonids Live! photo gallery. At its peak the 1998 Leonid meteor shower produced "only" 500 shooting stars per hour, well below the 10's of thousands per hour that rained down during the 1966 Leonids Storm. However, what this year lacked in numbers it made up for in dazzle. An unusually high percentage of Leonid meteors were "fireballs", shooting stars with magnitudes brighter than -3. Some were so bright that they cast shadows, and some were seen during daylight hours. "It's the most spectacular meteor display I have ever seen" said Brett Gladman, an experienced observer at the Observatoire de Nice where the skies were clear and 450 meteors/hr were observed. Above: Many of the 1998 Leonid meteors were so bright that they could be seen in daylit skies, like the one shown here in an early morning photo from Hong Hong. This image was captured by Yan On Sheung at 2200 UT, 16 Nov 1998. Fireballs are caused by meteoroids that are essentially no different than the ones responsible for normal meteors. They are simply bigger (usually larger than a millimeter in size) and, contrary to intuition, slower. Many scientists think that meteoroids which travel very fast break up into smaller pieces high in the atmosphere where the air is thin. The tiny fragments burn up in the thin air without producing much of a luminous trail. Slower moving meteoroids penetrate without fragmenting to deeper, denser levels of the atmosphere where they become bright meteors, or even fireballs. Sign up for our EXPRESS SCIENCE NEWS delivery Leonid meteoroids hit Earth's atmosphere at about 72 km/s (158,000 mph), much faster than typical meteoroids. If fireballs are caused by slow-moving bodies, then why were so many fireballs produced by the fast-moving Leonids? Astronomer Dr. Tony Phillips speculates that "the debris stream from comet Tempel-Tuttle -- the parent comet of the Leonids -- probably contains a significant number of larger-than-average meteoroids. So while the Leonids are fast-moving and probably fragment in the upper atmosphere, the fragments themselves are large enough to produce fireballs when they hit the lower atmosphere." "[On Nov. 17] at 06:12am CST (partial daylight) I saw a LARGE yellow/red fireball, which ended in a large flash. A few moments later, perhaps 30-45 seconds afterward, there was a long rumble and retort from the same direction. The sound was similar to distant thunder or a sonic boom." "I was happy to witness such a tremendous spectacle.... A bluish one of magnitude -13 produced shadows and an image of itself reflected on the Atlantic Ocean, with a train that persisted for over 2 minutes. Unforgettable... Four sonic booms were heard 8 minutes later but I'm not certain they [were] related to it. These photos were taken by Paulo Raymundo in Bahia, Brazil at 0717 UT on November 17th. Although the pictures show blue sky, the photos were actually taken at night. The first image shows a -13 magnitude fireball only partially captured on the frame. It was so bright that the sky was briefly illuminated like daytime. A second image 2 minutes later shows the residual smoke train. The belt and sword of Orion are visible in the upper right. At approximately 2:30 AM on the morning of November 17, 1998 near Winterset, Iowa during a peak performance of 150+ meteors per hour, this smokey remnant of a Leonid meteor hung in the air for ten minutes! A second meteor is seen cutting through the field of view during the exposure. Photo by Tom Bailey (© 1998, all rights reserved) of the Des Moines Astronomical Society. exploded over Hong Hong. The photo was taken at about 2030 UT on November 16th, 1998. The same train was photographed by another Hong Kong astrophotographer, Ms. Ruby Leung. Her picture is located at the Leonids Live! photo gallery. A second type of trail is called a smoke trail. Smoke trails are composed of non-luminous particles stripped away from a meteoroid by friction as it flys through the atmosphere (this process of stripping is called ablation). They appear similar to contrails left behind by aircraft, and are generally seen during the daytime because of the sunlight they reflect. 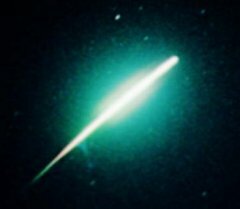 Although several Leonid fireballs were reportedly seen during daylight hours, we have not yet received reports or photographs of daytime smoke trails. A bust or a blast? Valentin Grigore of the Romanian Society for Meteors and Astronomy is an experienced meteor observer who monitored the Leonid shower from Targoviste, Romania on the night of 16/17 November. In a 6-hour observing period under dark skies he saw 796 meteors, of which 193 were fireballs. When the shower peaked in Romania, with 200+ meteors per hour, nearly 40% of the shooting stars were brighter than magnitude -3. Many were brighter than Jupiter, Venus, and the full moon. Some have characterized the 1998 Leonids as a disappointment because the number of meteors per hour did not approach that of the 1966 storm, when 40 meteors per second were seen in some places. The peak of the 1998 Leonids was hardly greater than an outburst of Giacobinid meteors earlier this year. Still, many of us like Valentin Grigore, who were favored with dark skies on the nights of November 16th and 17th, recall the shower of fireballs as one of the most dazzling sky shows ever. The International Meteor Organization has suggested that the 1998 Leonid shower is similar in some respects to the 1965 shower, which preceded the Great Storm of 1966. If they are correct, the 1998 Leonids could be the prelude to an even greater spectacle next year. Or it might be another "bust". The only way to be sure is to go outside and look!